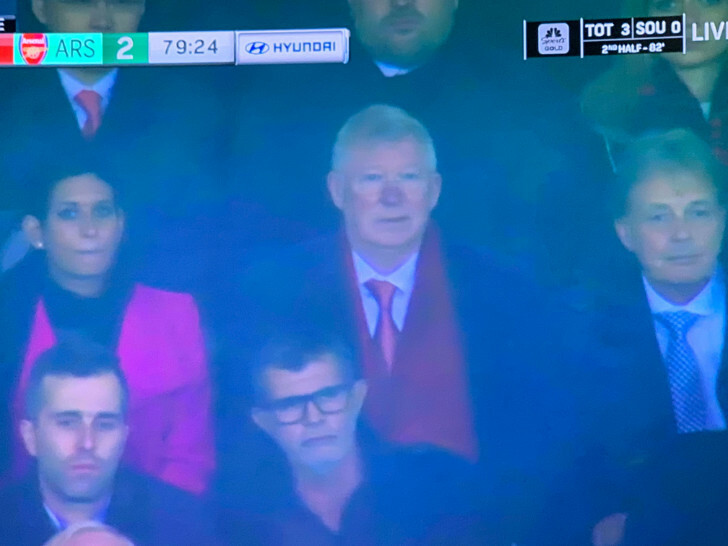 Sir Alex Ferguson was sat in the stands at Old Trafford as Manchester United came from behind to a rescue a 2-2 draw with Arsenal on Wednesday night. Arsenal travelled to Old Trafford buoyed by a thrilling 4-2 victory over Tottenham Hotspur in the north London derby last weekend. The Gunners made the breakthrough in the 26th minute when David De Gea’s error allowed Shkodran Mustafi to open the scoring from a corner. However, Manchester United were level before half-time thanks to Anthony Martial’s precise finish four minutes later. Arsenal lost Aaron Ramsey and Rob Holding to injury in the first half and it was substitute Alexandre Lacazette who bundled the ball over the line following Marcos Rojo’s misplaced pass to restore the visitors’s lead. But in a remarkable turn of events, Manchester United were level less than 60 seconds later when Sead Kolasinac’s poor touch presented Jesse Lingard with the chance to equalise. Ferguson was sat in the stands to watch his former team take on one of their traditional Premier League rivals at a rain-drenched Old Trafford on Wednesday night. And the Scot didn’t give away his emotions while watching Manchester United toil against Arsenal. Outspoken Arsenal shareholder Piers Morgan was pleased with a point after a thrilling four-goal stalemate at Old Trafford. Manchester remain in eighth place in the Premier League table and eight points adrift of Arsenal, who occupy fourth spot in the table after Chelsea FC lost to Wolves.